Thanks to Kim & Rich for another wonderful yacht charter! The entire experience was fantastic! Could not have been better. All of the above. Kim and Rich are fantastic people. We really enjoyed their company and their musical talent. Exceptionally good. Kim was very creative in the galley and Rich was a master griller. We enjoyed Kim's presentation of each meal and looked forward to every meal, even the beach picnic. Very informative, responsive and helpful. Everything was perfect. At Home In The Tropics. Fantastic! The Inn is perfect. It was a short, tho stair intensive walk to town which we grew accustomed to the first day. The owners are very helpful and terrific people. The amenities were great. Rooms and food excellent. Thank you all for making our 20th Anniversary Vacation a fantastic and memorable one! By the way... QWEST is available for CHRISTMAS and NEW YEARS! 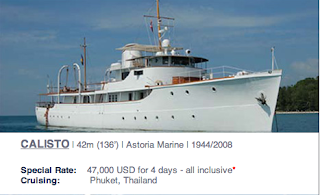 The motoryacht ANALISA has decided to drop their premium for Christmas and New Years weeks for the winter 2009/10 season. Add 2 children under the age of 12 for an additional $850. 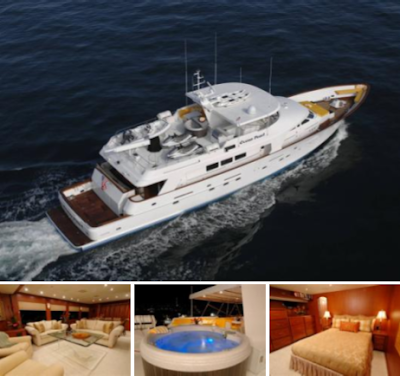 Analisa is a 60-foot Hatteras motoryacht and can accommodate up to 4 adults and 2 children. 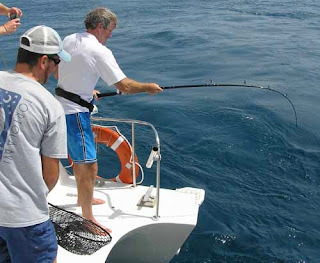 See their brochure for more details and then contact Paradise Connections to book your family's holiday vacation. 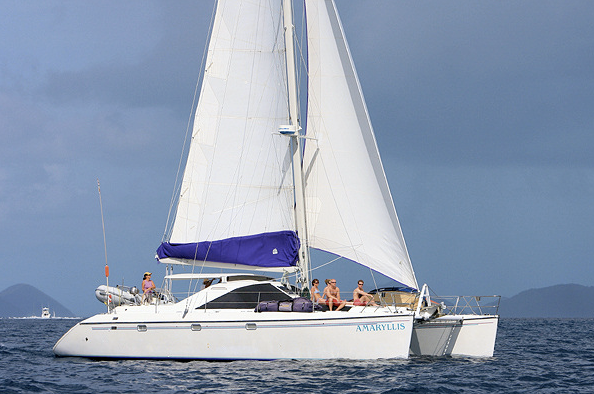 The charter yacht, catamaran AMARYLLIS, has a special of $1000 off their regular rate for any full-week charter taking place during the month of January 2010 (not to be combined with any other special, i.e. one child free or free rendezvous dive). 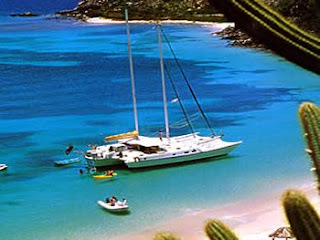 Yacht charter location is the US & British Virgin Islands. 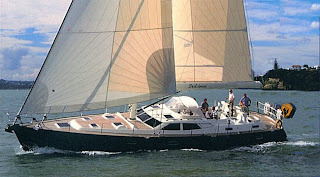 Amaryllis is a Privilege 45 catamaran, owned and operated by Laura & Bruce Masterson. 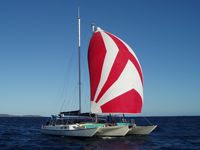 This charter catamaran is fully air conditioned and accommodates up to 6 guests in 3 double cabins. 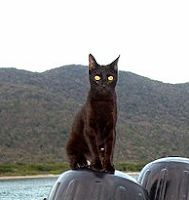 We received an email from Gus & Marcella, owner-operators of the Catana catamaran, MAROLANGA. 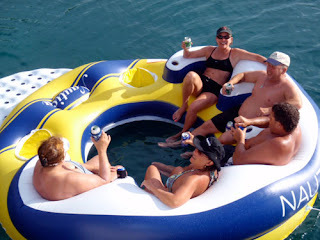 They plan to "splash" tomorrow and they are looking forward to getting out of the boatyard and back into the water. 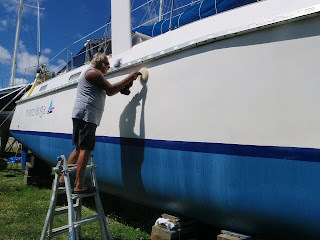 Here's a photo of Gus from earlier this week polishing the hull. 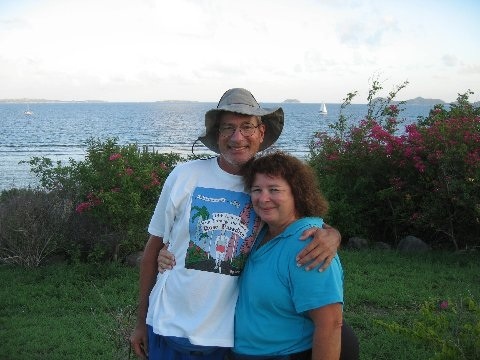 We look forward to seeing them next week when we sail over to St. Thomas, USVI. Marolanga is currently open for both CHRISTMAS and NEW YEARS !!! I know, we are really surprised, too. Don't miss out... Marolanga is an excellent choice for a family sailing vacation for the holidays! We have some other yachts we can suggest as well, so if nothing here quite suits your fancy, let us know and we'll see what we can do for you. UPDATED: Sept 11, 2009 - Quite a few changes have been made in the 2 days since I worked on this post... There have been a few confirmed bookings and some new holds. 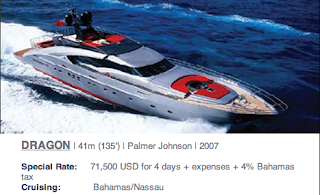 Since the holds are not confirmed, we still offer those yachts as we can always challenge the other party. We have updated the info below. Now that Labor Day has passed, we expect to be receiving our standard flurry of post-summer inquiries for holiday charters. 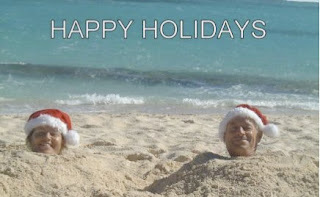 The 2009 holiday season is now over (Happy New Year) so we have edited this post to save space as the material is no longer relevant. 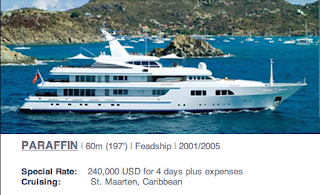 We received this recipe from Barbara of the Charter Motoryacht FLAME, a 65-foot Feadship in the Virgin Islands. This is one of our favorite recipes; even Wayne eats it! 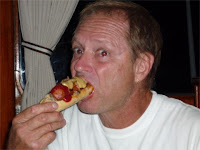 Wayne loves to kill "anything that swims, walks or crawls across the ocean floor" but really would prefer a hot dog for dinner! He does, however, love this risotto so I think that speaks volumes! I am always looking for ways to showcase the lobster Wayne brings home and this is a great favorite of our guests. Combine 8 cups water, about 30 shrimp shells, 1 or 2 lobster shells, 1 chopped onion, 1 chopped carrot, 1 chopped celery stalk, handful of parsley, handful of thyme. Bring to a boil, reduce heat, and simmer for 30-45 minutes or until broth is flavorful. Strain, pressing vegetables to release all flavor. Melt butter and olive oil, and sauté shallots and rice briefly. Add wine and cook, stirring constantly, until almost all absorbed. Add stock by the cupful, stirring until each cup is absorbed before adding the next. When rice is almost done (a little too al dente), stir in asparagus, then seafood. Finally, stir in 1 cup parmesan cheese and stir in white truffle oil to taste (add by the 1/4 teaspoon until it is to your taste. White truffle oil is VERY strong, use sparingly). Serve as a main course or with a baked filet of grouper or snapper. Garnish with remaining parmesan cheese and chopped parsley. Jake loves shrimp, lobster and fish! He waits on the roof, watching for Wayne to come home from hunting. If Wayne is not wearing a shirt Jake knows there might be goodies in the dinghy and will come tearing off the roof to greet Wayne at the ladder! 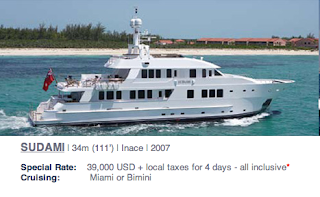 ECONOMIC BAILOUT option for 2-person charters! Save $500. The only difference is that you will have a crew of one. Alan will be Captain, Chef, and Dive Instructor. Offer good for Summer 2009 and Winter 2009-10, too! COCONUT now includes standard ship's bar! We hope you'll be able to take advantage of one of these special offers. You deserve it! 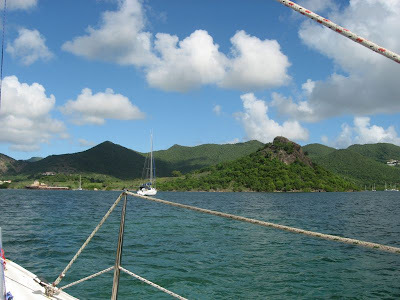 Richard and Lisa are back aboard the ever-popular charter yacht Promenade and they have decided that they want to fill up the last few remaining weeks available on their winter 2009/10 calendar, so they are offering an incredible deal to entice you aboard! These rates will apply to Thanksgiving week, New Years, and open weeks from now through January 2010. Promenade is then booked solid through the beginning of May, with the exception of the cabin cruise week of April 19-25 which still has 3 of 5 cabins open (see information here). So, what is this SPECIAL DEAL???? An all-inclusive 7-night charter aboard the charter yacht Promenade, a 65-foot trimaran well-known for fun and diving, at the discounted rate of $15,990 for up to TEN guests. 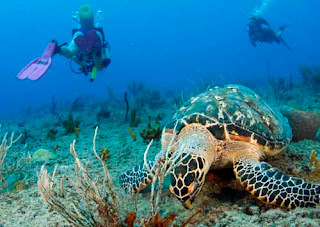 Their normal winter rate is $20,900/wk & $50/dive... about a 25% savings! It's snowing??? Not here ! Jim & Lisa, owner-operators of the charter motoryacht RUNAWAY, wrote to us yesterday to let us know that they want a Thanksgiving charter. Watch the football bowl games on Runaway's satellite TV with their new 52-inch LCD TV. 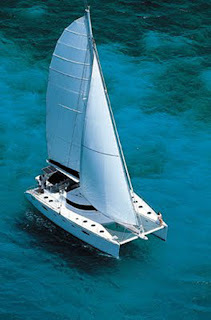 Runaway is offering a 20% discount on yacht charters taking place between November 18 and December 18, 2009. You can also look at this as an early Christmas present! 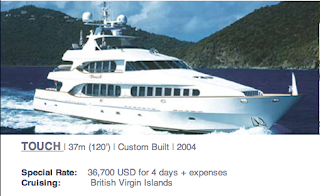 M/Y RUNAWAY is an 82-foot Azimut motoryacht with a crew of two, and accommodates up to 8 guests in 3 cabins. All staterooms have en-suite head with marble or granite countertops and enclosed shower stall. Each bedroom also has its own LCD flatscreen television with dvd/cd/mp3 player and individual climate control. The salon now boasts a 52-inch LCD TV for their Satellite TV. 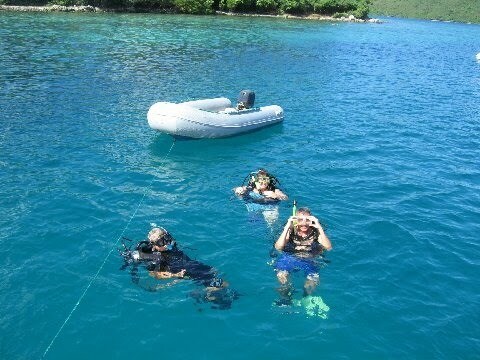 Jim is a dive instructor and Runaway offers diving for their guests. We hope that you'll be able to take advantage of this special offer! 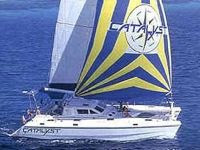 Special offer on select catamarans for Thanksgiving week 2009: Pay for 6 nights and stay for 7. That's a great deal to be thankful for! 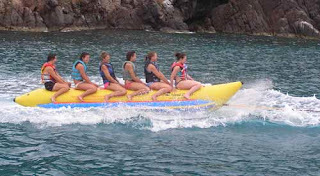 Inquire for rates for smaller charter groups. 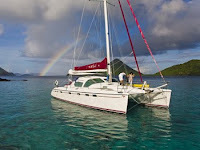 VIVO, a 60-foot Fountaine-Pajot catamaran, has just entered the Caribbean charter yacht fleet. The charter catamaran VIVO is fully air conditioned, has a crew of two and accommodates up to 6 guests in 3 queen cabins, each with ensuite head/shower. 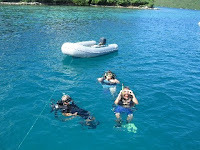 Jason is a dive master and VIVO includes 5 dives/week for certified divers. 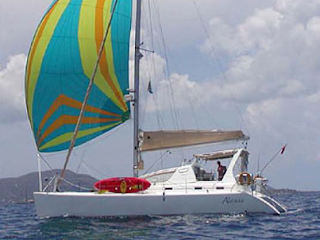 The catamaran ALEXIS will be chartering in the Virgin Islands through November and then they will be leaving to continue the sailing adventure they started 10 years ago. Thanksgiving is Thursday, November 26th this year (2009). If you are looking for a special way to spend your Thanksgiving weekend this year, how about one of these? 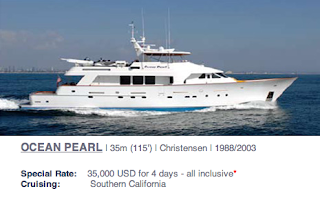 The charter yacht OCEAN PEARL, a 115-foot Christensen motor yacht, has a Special Inclusive Offer for Mexico this winter 2009-10 season! Such a deal! You may charter Ocean Pearl out of Puerto Vallarta, Mexico for 4-days/3-nights for only $30,000 and, that's an "all-inclusive" price! 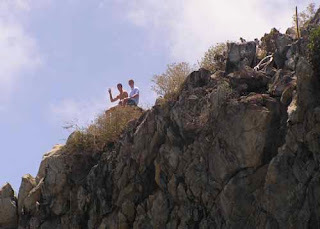 Explore the beautiful coastline of Mexico watching whales, swimming with the dolphins and zip lining through the canyons! We received word from Dulcinea that they are out of the New England shipyard and they are making their way back home to the Caribbean. The engine was removed and completely stripped down and rebuilt by Mac Boring of Yanmar -- so the engine now runs as new! It is much smoother and quieter also. DULCINEA has been fitted with a new state-of-the-art Varifold 4-blade folding propeller and also a new transmission. We can now motor very comfortably at ten knots having eliminated vibration higher rpm's. In addition, we have noticed a significant increase in DULCINEA's sailing performance as the new propeller is very streamlined when folded, compared to a traditional fixed prop. We are looking forward to a busy Caribbean season and offering guests even more comfort from the above upgrades during charters on board DULCINEA. Thanks for the update, Jon. DULCINEA is a 63-foot Dixon sloop, with a crew of two. Ducinea is fully air conditioned and accommodates up to 6 guests in 3 cabins, each with ensuite head/shower. 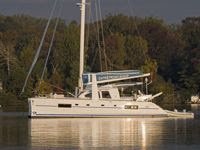 The aft master cabin has a centerline queen berth, while the other two guest cabins forward, each have a double berth. 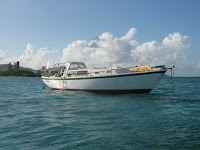 Winter 2009-10 Caribbean, All inclusive except special requests, taxes, dockage & communications. We look forward to visiting Dulcinea at the Antigua Charter Yacht Show in December.